Grants Pass to Alameda park. 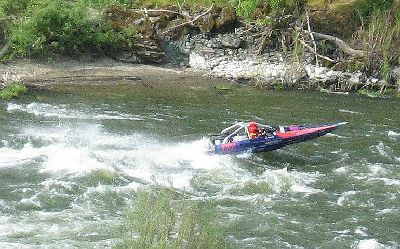 Thirty three miles on one of the most famous rivers in the west, set and backdrop in several movies, home of pioneer whitewater runner Glen Wooldridge, jewel of the Rogue Valley. 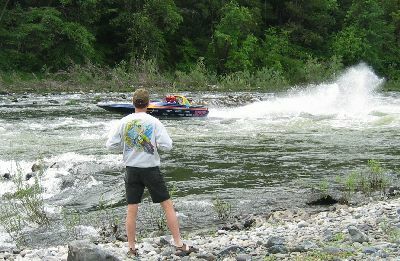 It is also many people’s single life experience of whitewater via the tour boats that operate out of Grants Pass and Gold Beach. I love this race. 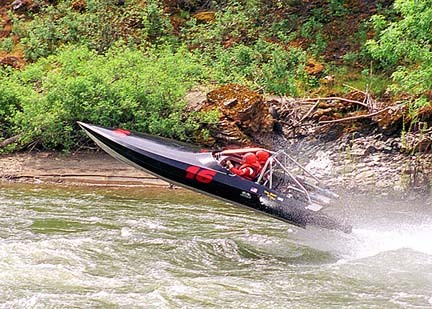 To me, it is what whitewater racing is all about, the essential race, the whole thing that racing is about. We’ve never had better than mediocre luck there, and usually poor luck. I have yet to make what I would call a perfect run in either direction. I will keep trying, after all I grew up in Grants Pass. 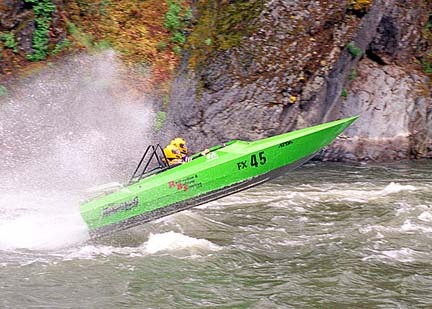 This year the Rogue was high, lots of water. That was good in some cases, bad in others. 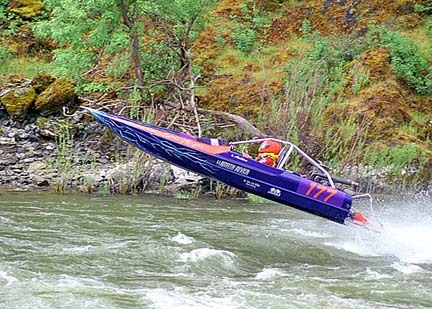 I prefer low water on the Rogue. Yes there are more rocks to hit, but you don’t have to contend with couch-sized rollers at Dunn, and upper and Lower Galice. My preference, that’s all. First boat to qualify, no ducks. 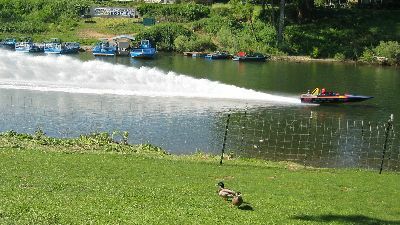 A few minutes later, now we have ducks. Did they come to watch the qualifying? Now it's ducks and pigeons. Sleeping on the grass no less! What the heck? Guess they got bored and went to cruise the Curly Fry stand for handouts! 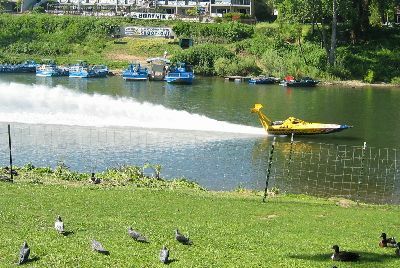 This year we did "qualifying runs" in front of Riverside Park. These were our typical ten second white flag starts and a run back up Park Riffle, under the bridge, to the finish line at the east end of the park. It was about a quarter of a mile run. 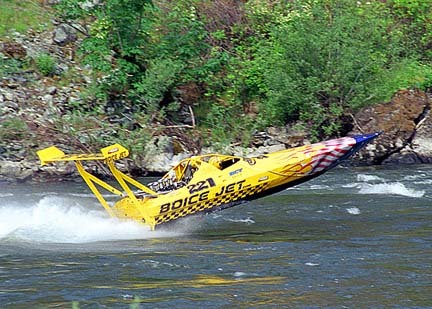 It was fun and counted for half points, but none of our boats are drag racers by any stretch. We each got two runs. Our first run I chickened and stayed left, but not far enough. We got a big hop, and lost some time there. The next run, I went further left, next to the bushes, and that was better. I had heard there was a smooth spot on the far right, but I couldn’t see it so I didn’t try it. 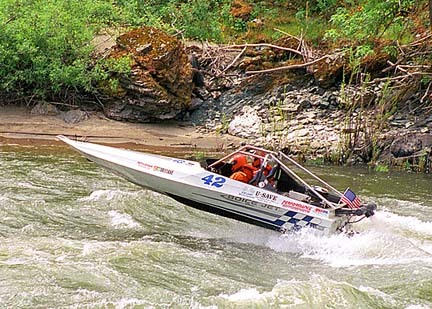 The runs in no way determined start order, because our boats are not drag racers. 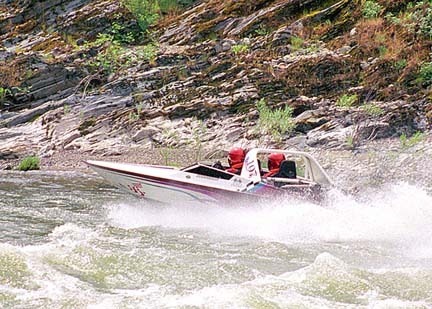 A short quarter mile run will not tell you anything about the top speed of one of our boats. You need about a half mile to get a good idea of what one of these boats came maintain for 35 miles. Our first day was good, we ran down fast, faster than everybody else in FX. I was sure that wouldn’t stand! The run back also felt good, but Steve got there faster than we did. Not by much, but still faster. On the run back up, Dean Saxon #107 "Velocity" and Bob Nicklason was having fuel pressure problems, his motor kept trying to shut itself off when he came close to idle. It did shut itself off at Dunn, just after Dean had hopped that first standing roller along the south side of the river. 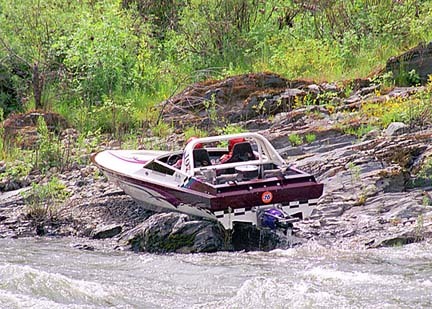 The boat hit the water, sheared right and parked gently up on the rock ledge there. With no motor, you are just along for the ride. The boat goes were it feels like. Notice that the Shotgun is closed on the left header- the right one hangs open all the time as I remember. 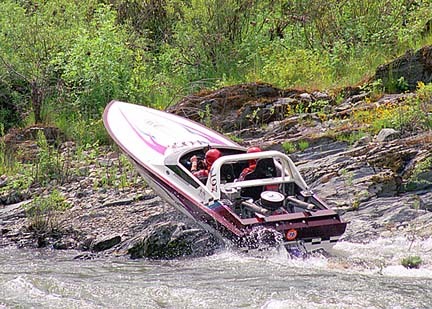 When we arrived, Dean and Bob were both out of the boat and up the bank a little. There was a yellow flag out, so I slowed, but not a lot. We hopped the roller, got the pump sucking water again and took off. After Steve had passed, the helpful crew that hangs out at Dunn pushed Dean back in the water, held him while he fired up then pushed them out to continue on. These guys are always there and have shoved lots of boats back in the water over the years. They need a sign or something. Maybe one that reads "Valet Parking". Dean had just gone around the corner when Bob White in #49, "VanStress Express" came around through the smooth water at Dunn, hopped the roller, got sheared right and also slid up on the ledge. 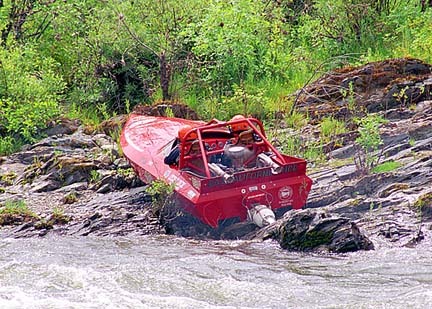 I watched some video of the whole thing, and I can't hear Bob's motor running either after their hop and before it slide up on the rocks. Not a heck of a lot you can do with no thrust and no steering except hang on. At the end of the day, Justin Boice and Steve Burks in #221 "Boice Jet" had cut a time of 38:44 for both legs, a little over two minutes faster than Paul Bagshaw and Rob Soules also fast time of 40:49. If it is indeed 33 miles to Alameda, Paul’s time gives an average speed of 97 mph for the whole run! Justin’s figures out to be 102 mph. All I can say is wow. No way could I ever drive and think that fast at the same time, no way, no way, no way. Everybody finished eventually on Saturday except for Bob White, who was probably damaged from landing on the rock ledge. He didn’t slide up on it quite as gently as Dean had. 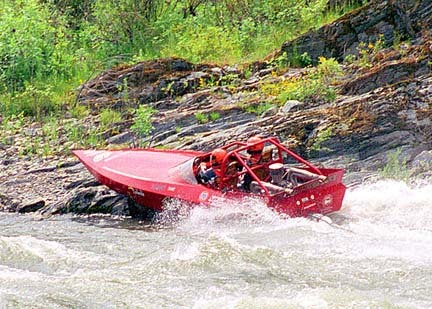 It looks like both shotguns are closed, even in the first photo and I very much doubt that if Bob had any control at all over the thing that it would have ended up on the rocks, he's been running boats way to long for that. Dave Provost and Toby Smith #182 "Risky Business" spent a little time on the beach above Finley Bend trying to figure out why the motor was getting no fuel then discovering it was because one tank was turned off and the other tank was now empty. Dave, don’t hate me for putting this in here, I have to, it’s my job to report this stuff. It’s also been my bad dream since I started using saddle tanks. I’m gonna do exactly the same thing eventually, I just know it. Seth Bogner and Mitch Gomer #177 "Exhibitionist" lived up to their name and slid up on the beach somewhere around Galice. 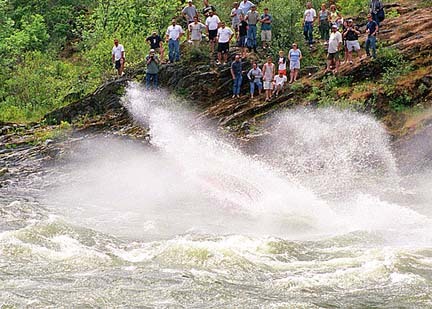 They were by all accounts helped back into the river by willing spectators and continued on to Grants Pass. Steve Hanlin got us by that damn eight seconds again, putting them six seconds ahead of us. If he hadn’t spent time at Dunn getting around the safety boat and across the rollers, it would have been a lot more! I am sure I could have gone faster, but I can’t tell you quite how. Going faster through places I had no business going as fast as I was to begin with, maybe! Me and my shook up navigator got back to Grants Pass, happy enough with our run. So far I am still wandering around in the "Amazed at how fast the boat goes" mode. Lynn is starting to edge towards "Attack while they are looking the other way!" mode. Jeff Bradley and Dustin Van Hulzen #42 "Morning Wood" did the down and up as fast as they could whip the little white boat into going, hit nothing and made no mistakes. 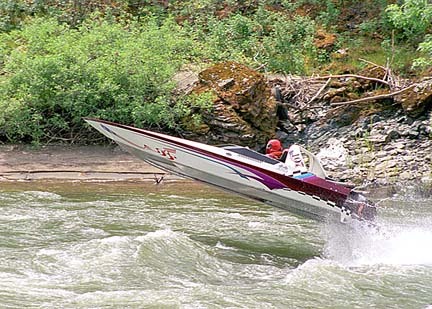 It’s what you do when your boat will only do X. You finish clean and wait for casualties. Been there. Done that. You feel kind of like a vulture sometimes, but you also usually place. Yeah, no doubt, it’s more fun to do it by speed and ability, but you just gotta do what you can. Sunday greeted us with remnants of rain showers and overcast skies. It was cooler however and looked to remain so. Good enough, lets go racing. Bob White was out, didn’t hear what was wrong. Probably damage from Saturday’s ride up into the rocks at Dunn Riffle. Jeff Bradley stepped on a nail and then ripped it sideways in his right foot, he was limping and also not running. Everybody he ran into told him to get a Tetanus shot, I am sure he got good and sick of hearing that! Justin Boice lost a lifter testing Saturday evening, they were out also. Paul Bagshaw and Dean Saxon have this great down line through Galice. Wish this picture had been available Friday night or that I had looked more carefully Friday morning! Six surviving boats of nine. Seth and Mitch going down through Dunn Riffle. The simple cooling system we finally settled on works quite well, warms up quick and requires little attention. I like that. I am no longer driving along waiting for another motor to cook itself. The motor is up to temp in about five minutes and doesn’t overheat idling around. Simple is better, that’s my new motto. Again. The skies looked like more rain and after a good fast run part way down, it began raining on us about Jump Off Joe creek. Doug Ely was our safety boat there and had a big two color umbrella. In spite of Lynn’s Rain-X job on our visors, I was not seeing well, so I was not charging the corners and riffles like was required. It was a slow down-run for us from there on, I could have done better but rain is the one thing that spooks me. At Dunn I again cut across the rollers into the flat water on the north side of the river. Its not all that bad going through the rollers, bumpy, yeah, but you are through it quick. The flat on the north side is longer and straighter than the flat on the southside. 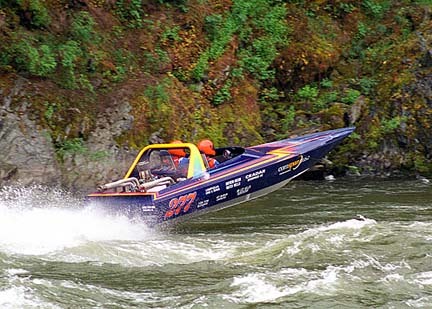 Jeff Bradley and Dustin Van Hulzen going up Dunn Riffle. These are the boats that arrived at Alameda under their own power. Dave Provost and Toby Smith were having a weird thing going on with their pump. 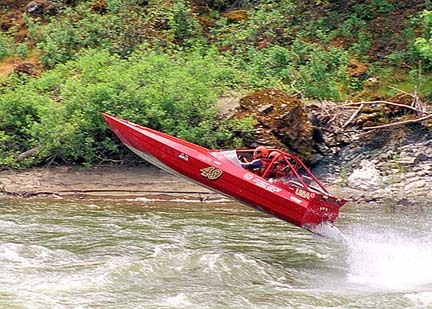 If Dave ran at any throttle setting other than wide open, the pump would start unhooking, like it was cavitating. Before they got to the real bad stuff, they wisely parked it and were trailered to Alameda. Darren Provost, Dave’s brother took the bowl off, and looked over the whole thing but could find nothing wrong. They decided it might have been a stick, that it fell out when they pulled it out of the water. They put it back together and decided to just run it, if it was doing the same thing they would park it. Steve took 24 seconds off his previous down run time, I on the other hand, I added 42 seconds to mine! Lets see, 42 and 24 is 66, that’s a minute and 6 seconds I had dropped behind plus the 6 seconds from Saturday makes a minute and 12 seconds out of first. Is Steve going to make a mistake on the run back? Nah, never happen. We saw Dave Provost parked well past the rough stuff so I assumed he had lost the weird pump problem and gained another. 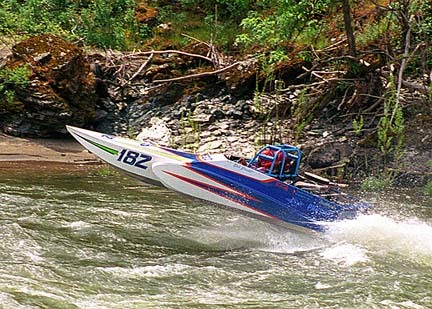 In my opinion, #182 is potentially the fastest B-boat that ever raced. I was hoping for Dave to complete this year with some spectacular wins, but I guess it is not to be. There is still Gold Beach, but I guess the question comes down to how much more can Dave take? 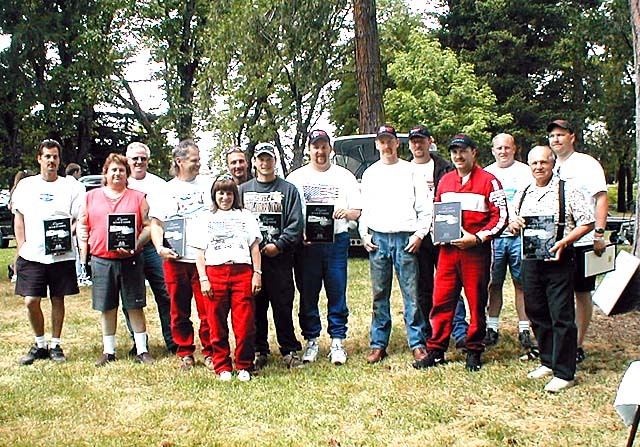 The fastest guys on the Rogue in 2003! #277 "Unpredictable"
The following photos courtesy Mark Sharley. Thanks Mark and Portia, makes what I write look like something other than ranting and raving.